2 Corinthians 6 is the sixth chapter of the Second Epistle to the Corinthians in the New Testament of the Christian Bible. It is authored by Paul the Apostle and Timothy (2 Corinthians 1:1) in Macedonia in 55–56 CE. 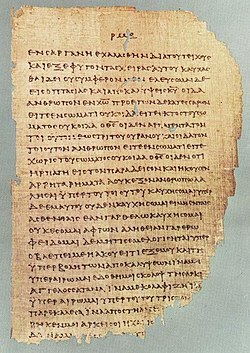 A folio of Papyrus 46 (written ca. AD 200), containing 2 Corinthians 11:33–12:9. This manuscript contains almost complete parts of the whole Pauline epistles. "In an acceptable time have I heard thee, and in a day of salvation have I succored thee: and I have formed thee, and given thee for a covenant of the nations, to establish the earth, and to cause to inherit the desert heritages". The promised hearing and salvation are offered first to the "suffering servant" in the time of the prophet Isaiah, then to Christ according to Christian interpretation of the servant songs, and finally, here, to the Christian people. Paul adds that the day concerned is "now". "Do not be unequally yoked together with unbelievers": may allude to the law in Deuteronomy 22:10 which is understood not to forbid civil society and converse with unbelievers, but to prohibit joining unbelievers in acts of idolatry, as one of the arguments is, "what agreement has the temple of God with idols?" which seemingly happened at that time (cf. 1 Corinthians 10:14; 1 Corinthians 10:20–22). "What fellowship has righteousness with lawlessness" (or KJV: unrighteousness"): This "righteousness" means righteous persons, having the kingdom of God in them. ^ MacDonald 2007, p. 1134. MacDonald, Margaret (2007). "66. 2 Corinthians". In Barton, John; Muddiman, John. The Oxford Bible Commentary (first (paperback) ed.). Oxford University Press. pp. 1134–1151. ISBN 978-0199277186. Retrieved February 6, 2019.